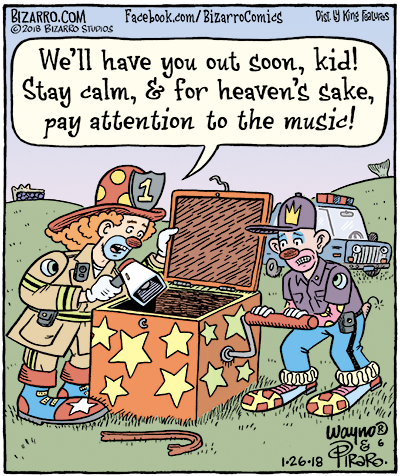 Bizarro is brought to you today by Strangers in Disguises. Regular readers of my Bizarro blog are familiar with a guy whom I call "Cliff Harris the King of Wordplay." Wordplay and puns are the easiest and most common kind of humor and cartoonists have varying degrees of tolerance for the category. Some will use any pun, no matter how predictable or lame, some, as a matter of principle, won't use any pun, no matter how fresh. For me, it's all about surprise; if a pun or a bit of wordplay surprises me and I chuckle, I'll use it. This one made me chuckle a lot when Cliff suggested it and it still does. Now let's review what my partner, Wayno did this week while I wasn't looking. We begin with a fun little take on an Old Testament story about knocking down the walls of an enemy city by blowing horns. I can't vouch for the veracity of every story in the OT, but I can say from my experiences living in Mexico that if "musical" noise at high volume could knock down walls, there would not be a building still standing in this country. 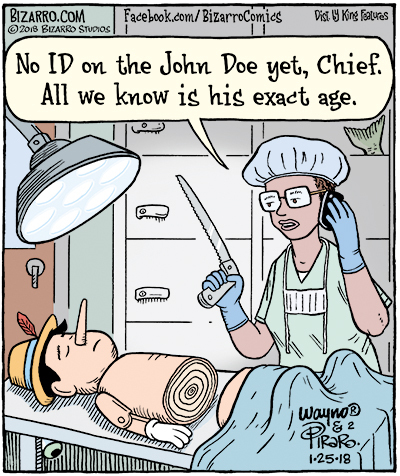 This is perhaps my favorite cartoon of Wayno's this week. Something about the incredibly creepy look on the tomato's face as he attempts to beckon children to play with him is hilarious. It reminds me a little of the signs one sometimes sees outside of American BBQ joints that feature cartoon pigs beckoning you to butcher and eat them. Even as a kid I thought it was a little sick. 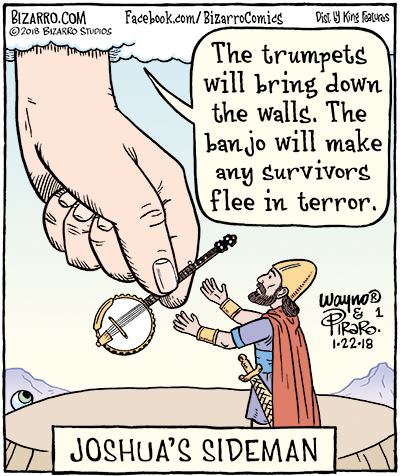 On Wayno's weekly blog, which you should check out when you are finished here, he also shows this cartoon in black and white because it is even creepier. Don't miss Wayno's blog link at the end of this post. As predicted, I got one complaint from someone who thought this cartoon would traumatize children. I often wonder if people like that have ever met an actual child of normal intelligence. This is one of those gags that takes a few beats and a second look to get. 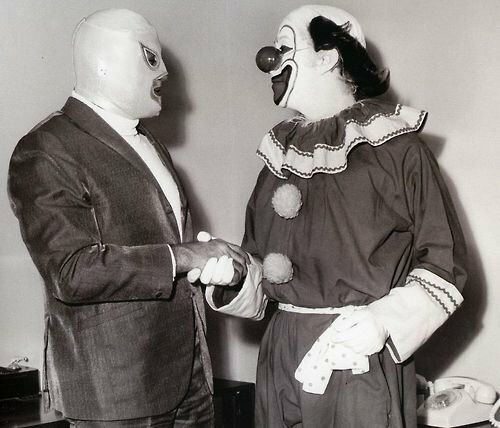 As Wayno mentions on his blog today, if you're having trouble getting this one, listen for music as the clown on the right turns the crank. A number of Wayno's friends and more devoted followers have noted that Wayno is in a band with two other dudes and that their posters often look a bit like the one in this cartoon. Most of the venues his band has played do not allow dogs on the premises even though a few of them possess a smell that dogs would not find unattractive. If you'd like to follow Wayno's band, drop by here. One last bit of art fun: For the past week, Olive Oyl and I have been hiding out on a remote beach in Mexico. It's not my first vacation in 33 years, but it is the first one without the specter of endless cartoon deadlines hanging over my head. It's wonderful. but I brought a bunch of watercolors so I'm still painting daily. Here's a fun one I completed a couple of days ago. "Luchador in Bloom" watercolor, 7"x10". 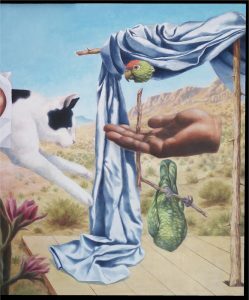 When I moved to Mexico, I decided I would sign any fine art that I completed here "Diego Piraro" in honor of Rivera and Kahlo and this is the first to be signed that way. I'm having an art show in Mexico in October and this one will likely be for sale. I intend to do more small, surreal luchador paintings, and I will eventually offer some of them for sale as prints, as well as the original art. Stay tuned. Thanks for reading this far, Jazz Pickles. Have a great week and check out our various links below. Until next week, be smart, be happy, be nice, and fight ignorance and fascism.